Delingpole: De John McCain Nil Nisi Bonum. And, boy, is the political and media class taking this aphorism to extraordinary extremes in the case of the late Sen. John McCain! To hear all the plaudits being lavished on this apparent paragon, you’d imagine that he was the greatest president America never had. And it’s as bad on this side of the pond as it in the U.S.
One virtue-signaling politician, a British conservative MP called Tom Tugendhat, has actually petitioned for the NATO headquarters to be renamed after McCain. Really? Do Tugendhat or any of the other commentators queuing up to praise McCain actually know anything about the man, beyond his carefully cultivated propaganda myth as the heroic flier and POW who wouldn’t buckle? All I knew was that he was shot down in Vietnam (where he was apparently very stoical and brave) and that after that he became a failed presidential candidate, ending his career as a thorn in the side of Donald Trump. A modestly notable career, maybe. But hardly enough to justify all these “we shall never see his like again” eulogies. But then, I caught sight of this fascinating Rolling Stone profile written by Tim Dickinson in 2008 at the time when McCain was supposedly the Republican Party’s great white hope against Obama. OK, so it comes from a publication with a known leftist bias. But it gives the impression of being pretty thoroughly researched and sourced – and if it’s even halfway accurate, then all those virtue-signalers currently pontificating about how marvelous McCain was ought to blush furiously over their ignorance and their misplaced praise. Look, I’m not judging. I never did military service. I haven’t a clue how I would have borne up if shot down and tortured by the North Vietnamese. But then, I’m not a soldier or a navy flier; I’m just a journalist whose stock in trade is facts. If I offer an opinion on something, I try to do a bit of research. Read the profile yourself if you’re in any doubt. It’s a long read but utterly gripping. “Why are you going to the Middle East?” McCain asks, dismissively. “It’s a place we’re probably going to have some problems,” Dramesi says. Yet, now, according to his eulogists, we’re supposed to airbrush all these awkward details out of history and concentrate on the most important lesson to be learned from the life of John McCain: that Donald Trump is the worst president ever and should be impeached. No really. I don’t know why these people bother even pretending that they gave a damn about McCain or whether or not the flag was flown at half-staff outside the White House or any of the other sanctimonious drivel they’ve been foisting on us these last two days. You can tell just by looking at the people saying this stuff: they’re all either on the left or they are Never Trumpers. 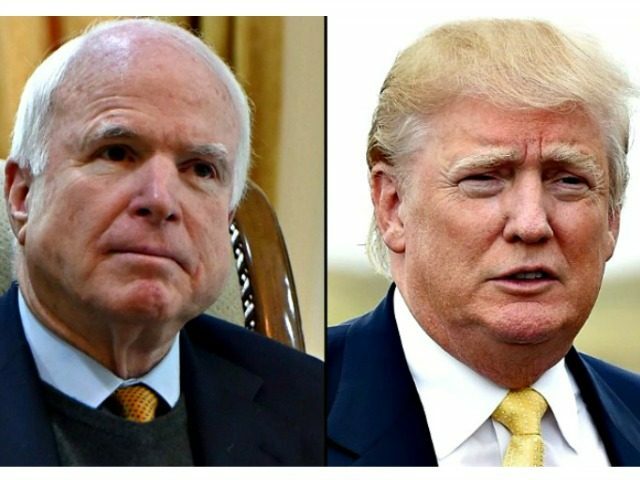 It’s code: the more extravagant your praise for John McCain, the more strongly you are signaling how much you loathe Donald Trump. I wonder if this is how John McCain would have liked to be remembered: not so much for anything he did; more for being the person he was not.